New York City band Radio Jarocho plays son jarocho music fashioned after the towns, musicians and swampy countryside of Veracruz, Mexico. They also write their own songs inspired by this popular genre and tailor them with assorted influences creating a contemporary repertoire that albeit captures the spirit of the traditional style. The band championed son jarocho, (a mix of Afro-Caribbean, Spanish, and Mexican Indigenous dance and music,) in the East Coast by performing in dozens of concerts and fandangos over the past ten years in New York City, Washington DC, and Boston. In the summer of 2011 they successfully toured Chicago and in the fall completed an acclaimed tour in New York with son jarocho legend Patricio Hidalgo. After spending a year writing and performing their first collection of songs, Radio Jarocho teamed up with Grammy Award winner Alex Venguer to record and produce the band’s first full-length album “Café, Café”. 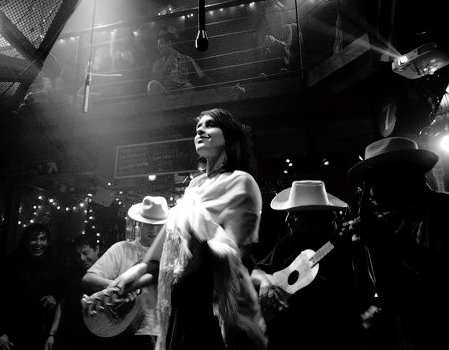 The album, due on early spring of 2012, will surely take Radio Jarocho to explore new places in the U.S. and bring son jarocho and the band’s original songs to more people.